What you have here is all the flavor of tacos cooked along with Mexican Rice and topped with a generous layer of cheese. Two kinds of cheese, btw, all to tempt you to dig in. I love a little heat so used the cayenne and the hot sauce (optional) and a hot salsa, but tone it down by choosing a mild salsa and leaving out the hot sauce and cayenne. Easy Taco Skillet Dinner is quick and while it simmers away, gently, on the stove, its hands off. Great for a busy night with a lot going on and barely any time to cook. And the clean-up is minimal. Gotta love that! 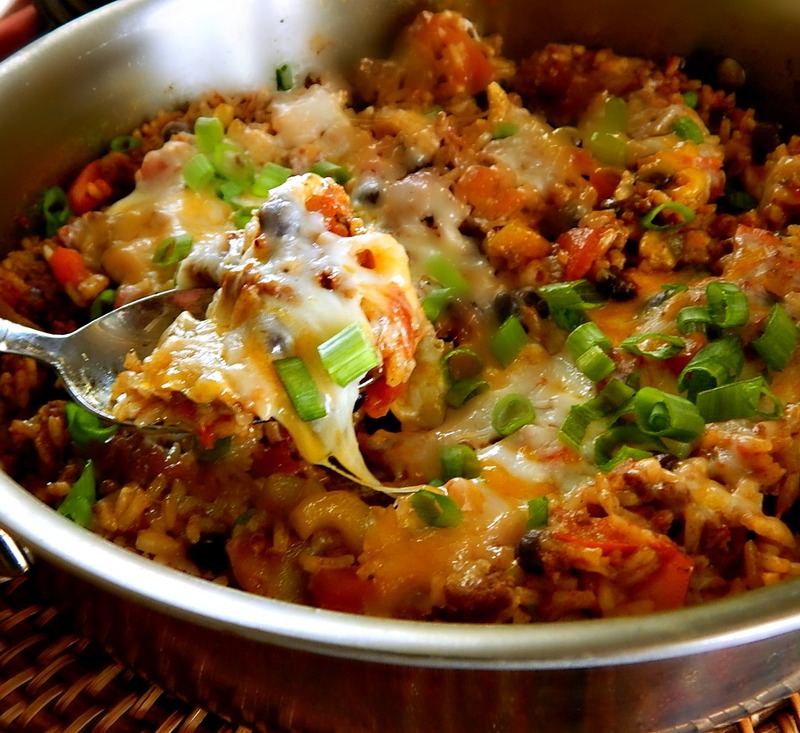 You can easily change this Taco Skillet up. Just keep in mind the rice needs the liquid to cook properly, and that includes the water and the liquid in the tomatoes as well as the salsa. Other than that, change out the beans, add corn if you’d like. If you don’t have time to measure, use a Taco Seasoning mix. Add any favorite garnishes – maybe a dab of sour cream or some black olives? Maybe you’d like to serve this with chips or refried beans. It would be fantastic in tacos or wrapped up in a burrito. Cheese often goes on special; when it’s at its low, buy and chuck it in the freezer. It will be a bit crumbly when it thaws, so it won’t be so good for slicing and eating, but it’s still perfect for cooking with. A quick little cheese trick: Instead of sprinkling evenly over the top of an item like this, concentrate it in several areas. It will seem like more; notice I laid the cheese down in a rather thick ring around the center of the dish. In a large skillet with a lid, over medium high heat, add ground beef and cook, crumbling as it cooks. As soon as it starts to give up the juices, add in the onion and bell pepper, continuing to cook until the vegetables have softened and the ground beef is cooked through. If ground beef is very lean it may be necessary to add a little bit of oil to the skillet. Add the garlic, stirring for a minute or so until it becomes fragrant. Spoon off excess fat if needed. Add the chili powder, cumin, cayenne, salt and pepper and briefly stir. Stir in tomatoes with the juice and the salsa and add the black beans and hot sauce. Toss the rice on top and add the 1 1/4 cup of water. Gently stir together, bring to a boil. Cover with lid and reduce to a bare simmer. Cook for 22 to 24 minutes until rice is just done. If possible, don’t lift the lid or stir until rice is finished. Turn off the heat and with a spatula, gently turn the mixture from top to bottom. Add cheese to the top. Cover with lid and let sit for five minutes. Note: To make this quicker, instead of the garlic, chili powder, cumin & cayenne, add a packet of taco seasoning or use my home-made taco seasoning. This entry was posted in Click here for Bargain Meals, Click here for Fabulous Food Posts and tagged Beans, Bell Peppers, canned beans, canned tomatoes, cheddar, Cheese, complete skillet meal, Green Onion, Ground Beef, Mexican or Southwestern, Monterey Jack, Rice, Rotel. Bookmark the permalink. This is an absolute fave of ours! So simple but so good! Gonna make it this week, my kids will love it! Wonderful! I hope you’ll let me know how you guys like it! This looks amazing! My family loves Tex-Mex , very excited to try this. Jessica, this is such a great, fun family dinner!! I hope you guys love it! Loved making this with the leftovers I wrapped it in a flour tortilla. I love these kind of skillet dinners. They are so convenient! It’s hard, I know. There’s no one “right” decision. Thanks Chef. 🙂 I’m still settling back into my house in Minnesota so it was really nice to have a panful of this to go through. Lots & lots of cleaning and washing to do when the house has been left alone for some time! I can imagine, still wish you some happy times and lots of cooking in Minnesota, can’t wait to read some of your new posts! This is going to be a hit with our family for sure! Mexican flavors and melty cheese get us every time! I made it twice, everyone loved it so much! Thanks Josette. I think this is going down as a family fave. 🙂 It’s so simple and so easy to customize. Great meal. I made a similar mixture (using ground turkey thigh meat from my Canadian Thanksgiving turkey) and was going to put it into burritos etc. I think adding it to a rice/tomato salsa skilled would be very tasty. That’s right! You had your Canadian Thanksgiving already. 🙂 I think it would be great with ground turkey and healthier, too. It must be Tex-Mex week, lol! I make something similar quite often, it’s a family favorite!